The story of Mukul Shivputra (born on March 25, 1956) is very sad indeed. 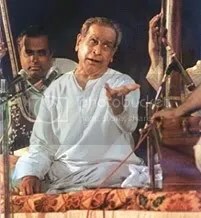 Born to one of the greatest vocalists of Hindustani music, Pandit Kumar Gandharva and Bhanumati Komkali, Mukul apparently could not cope up with the pressures and expectation one has from a son of such illustrious parents. He took to drugs and alcohol. During the recent past he has performed infrequently and irregularly in the public, which is mostly attributed to his addictions. On 15th May, 2009, The Times of India reported that Mukul was seen begging for money outside a temple in Bhopal. 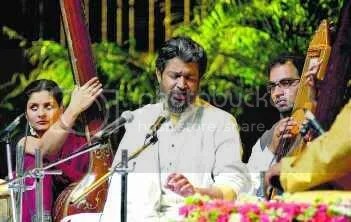 One of my readers has just informed me that Mukul Shivputra was unable to perform in the Vasantotsav concert held on 22nd January, 2011 in Pune. 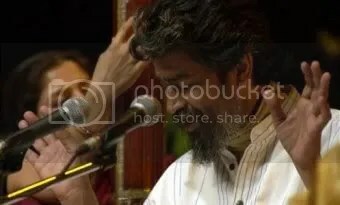 Rahul Deshpande, one of his disciples was in tears seeing his guru in such a state. His recordings have become rarities and collector’s items, something unheard of any artist who is still alive and so talented.